This past March, more than 50 education technology and curriculum leaders came together to learn, share, and make connections to support instruction in districts across the country. From Boston, Houston, Seattle, and everywhere in between, leaders converged in Marina Del Rey, California, to collaborate. The Tech & Learning team planned a robust agenda that was a mix of content, connections, site visits, learning about new products, and opportunities for district-level leaders to share their challenges and successes as they strive to improve teaching and learning. The Tech & Learning Summit was not just a technology event, but a leadership event. Social Emotional Learning (SEL) is a growing concern for districts across the country, and tech can be a powerful tool to support the social emotional health of students. With this in mind, Tech & Learning started the Summit with a visit to Headspace (https://my.headspace.com), creator of the popular mindfulness app. Headspace has one mission: to improve the health and happiness of the world. And with millions of users in more than 190 countries, they are well on their way to achieving this goal. Headspace founder Andy Puddicombe, who’s in his early twenties, cut his sports science degree short to become a Buddhist monk. Over time, he started a meditation consultancy and began working with politicians, athletes, and business leaders. Andy then met Rich Pierson, who needed help dealing with the stress of the advertising world. Before long, Andy and Rich were skill-swapping meditation for business advice. That’s how Headspace was born. Tech & Learning Summit participants heard the Headspace story, took time to experience a mindfulness exercise, and saw the inner workings of a start-up focused on design thinking. Headspace challenges every employee to bring their unique lens to their projects. The building is equipped with work spaces, quiet cubicles, Ping-Pong tables, popcorn makers, swings, a full kitchen (with snacks), and many other items that allow the staff to create, collaborate, and build. Group thinking and design organization were on full display. Tech & Learning Summit participants saw Headspace’s creativity and freedom and began talking about how to bring those strategies back to a school setting. Supporting SEL and giving participants an inside look into a start-up was the perfect way to kick off the Summit. The conversations that followed the Headspace visit focused on creating learning environments where teachers are supportive, students are inspired, and children care about one another. Students and staff must feel safe when working together to solve challenging problems. Headspace is one example of how technology can help cultivate this kind of environment. Dr. Street shows attendee Randy Rodgers the VR experience from USC Shoah. Day two of the Summit kicked off with a presentation from Dr. Kori Street, Senior Director of Programs and Operations for the USC Shoah Foundation, founded by Steven Spielberg. Dr. Street gave a demonstration of their archive of video testimonials of genocide survivors—from the Holocaust to modern-day accounts. What started out looking like an archive of history videos turned out to be an experience the participants were not expecting. Attendees learned that the visual history archive is an online portal that allows users to search through and view 55,000 audiovisual testimonies of survivors and witnesses of the Holocaust and other genocides. The testimonies have all been catalogued and indexed. The highlight of these testimonials came when attendees “met” Tola Pinkus, a Holocaust survivor who spent dozens of hours recording replies to thousands of possible questions. Through technology that involved natural speech recognition and enhanced video recording techniques, viewers had the opportunity to interact with this “interactive biography,” asking Pinkus questions ranging from “what did you eat?” to “can you sing us a song?” The experience of having a conversation with Pinkus gave viewers a more personal connection with their experience. To create this experience, the USC Shoah Foundation partnered with the late Dr. J. Michael Hagopian to use current technologies and green-screen tools to film Pinkus’s stories and digitally archive all the interviews. The Shoah Foundation then used coding and software to identify keywords, so Pinkus’s answers would match the questions asked. Individuals can still watch the full interview in its entirety. But using the Q&A process allows learners to interact with the individuals, see mannerisms, observe personalities, and begin to take a true interest in learning more. Dr. Street shared that approximately 1,200 English-language testimony videos from survivors and witnesses of the Holocaust, 10 from survivors and witnesses of the genocide in Rwanda, and 12 from survivors of the Nanjing Massacre, are available. To learn more about this amazing free resource, visit https://sfi.usc.edu/. It was obvious by high level of participation that the sessions hit the mark. One common theme across all of the presentations was a focus on the process, or journey, of learning rather than the final product. The breakout sessions were based on a “students-first” idea—everything else simply follows and supports the learning. The true power of Tech & Learning events is the connections. This was on full display in Marina Del Rey. The connections with new and long-standing district leaders support the ebbs and flows of education and technology implementation. It was inspiring to see the incredible passion and inspiration of the participants. In Dr. Street’s presentation, she said, “It is not high tech, low tech, or no tech that makes an impact on learning. 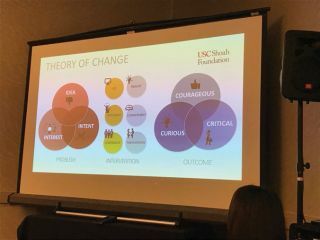 It is about the people and the testimonials.” The Marina Del Rey event was rooted in sharing, connection, and taking knowledge back to districts to support learning and student growth through innovative ideas and strategies. Dr. Matthew X. Joseph (@ MatthewXJoseph) is Director of Digital Learning and Innovation for Milford Public Schools, Milford, MA. Take-away: Independent initiatives are starting to come together in the world of education. The fusion of cross-curricular skills such as SEL, diversity, and citizenship are all being supported with technology to engage students and teachers. Take-away: Too often, people consider data security as a single topic. By breaking this topic into more granular components, such as data privacy, security, and identity management, district leaders across departments can work together to address related needs and issues. Take-away: It’s no longer “digital citizenship” but just citizenship! Digital is the world we live in now. It comes down to teaching citizenship. Take-away: Tools such as Makey Makey, Ozobot, Bee-Bots, Dash and Dot, and maker spaces, as well as organizations like Destination Imagination, push learning to more than just scope and sequence and integrate content creation as part of the learning. Take-away: Edtech tools are more effective when they match the learning goals. Starting with the pedagogy and then adding the most appropriate edtech tools will enhance learning. Take-away: We need to start adding furniture into classrooms that, rather than causing restrictions, helps teachers to use their spaces to improve instruction. Take-away: We need a system-wide approach to embed technology throughout the curriculum instead of teaching it in isolation.